This beautifully produced poem is a successfully implements the practice of taking a structure from the physical world and representing it in an electronic environment. In this work, it is a mobile made out of words and our pointer movements allow us to simulate wind movement and move up and down the cascading, spinning words and phrases. This deceptively simple interface combines three frames of reference— the mobile, family trees, and poetry— and puts them in motion to produce a haunting reflection on family history. 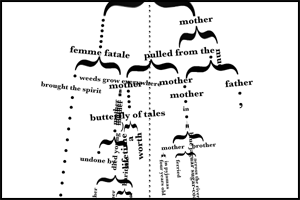 Download and run this poem to experience its oscillating rhythms, read its lines as they rotate next to others, forming new phrases, and think about how your own family tree has branches that terminate and others that continue to grow, spinning around each other or hovering in the past.